Last October, Iraqi Prime Minister Haider al-Abadi declared that ISIS had been defeated, but the group’s leader announced that they were back, using new tactics. Iraqi Army commanders and soldiers outside an Islamic State drone and IED factory discovered on June 23, 2017, in the frontline neighbourhood of Al-Shifa. Last October, Iraqi Prime Minister Haider al-Abadi declared that the Islamic State had been defeated but last month, the group’s leader Abu Bakr al-Baghdadi announced that they were back and using new tactics. NewsHour Weekend Special Correspondent Simona Foltyn reports on how ISIS has exploited Iraq’s poor governance, fragmented security apparatus and ethno-religious strife to survive for this report produced in cooperation with The Investigative Fund. Simona Foltyn: Another chapter in the war against ISIS has begun. At dawn, these soldiers from the emergency response division head out on a special operation. An elite unit of Iraq’s Ministry of Interior, they look for ISIS militants. Today, the mission is to search and clear an area of around six square miles near the northern city of Tuz Khurmatu. Colonel Kadhum al Aboudi: According to intelligence and information collected through surveillance drones and at some of the check points you saw on the way, the number of terrorists in this area is estimated at 60 to 80. Sometimes the number can even reach 120. 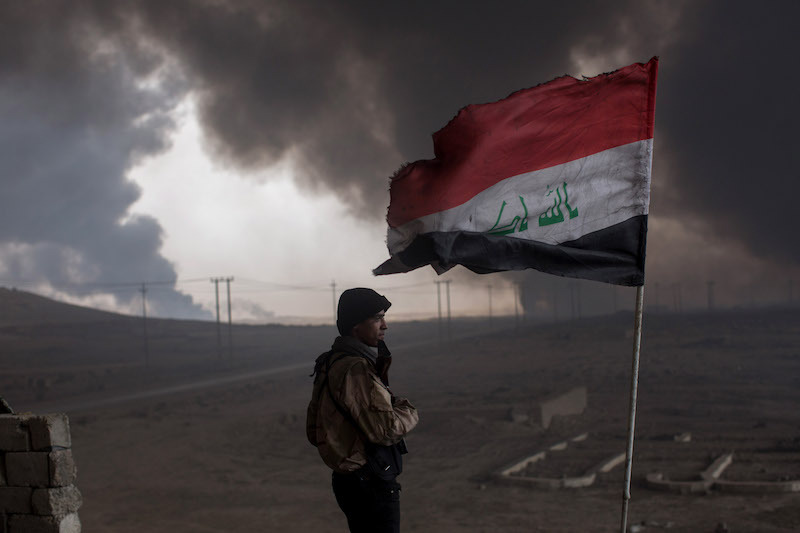 Although the Iraqi government declared last October that ISIS had been defeated, the terror group has risen again at the nexus of four Iraqi provinces. 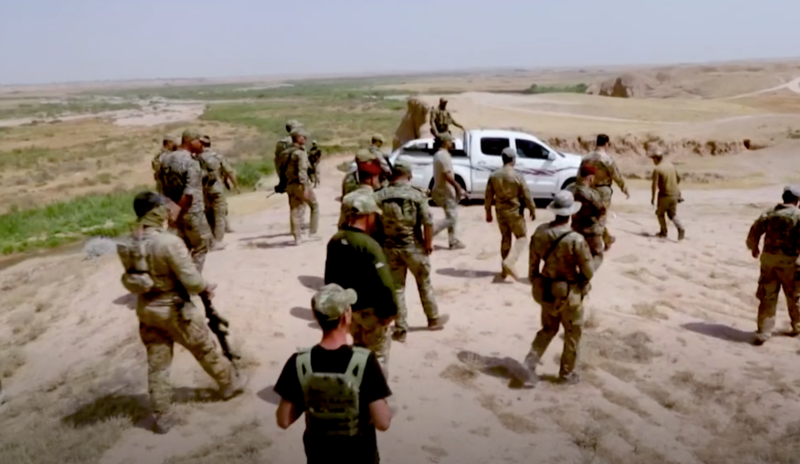 Iraqi troops, which have received U.S. training and support, seem ill-equipped to counter the insurgency: After troops declared an area cleared of ISIS presence, we documented at least two dozen attacks in the region. ISIS has also been successful in re-establishing presence in this area due to the recent conflict between the Kurds and the Iraqi government. When Kurdish forces withdrew from disputed areas in October 2017, they left behind a security vacuum. Simona Foltyn: For four years, the Emergency Response Division, or ERD – together with other Iraqi ground troops and support from the us – fought and appeared to win a grueling war against ISIS, but the terror group has risen again…At the nexus of four provinces – Kirkuk, Salahuddin, Diyala and Sulaimania. It’s an area home to strategic roads, oil fields and several mountain ranges, which provide a sanctuary for the militants. These coalition-trained troops are battle-hardened from having fought a mostly conventional war against ISIS. During the four-year conflict, the US supported the ERD with tactical advice, even though the unit had been banned from receiving military aid due to human rights abuses. ERD commanders say their troops have benefited from that advice, but their enemy operates differently now. Returning to its insurgent roots, ISIS avoids large deployments that are easily seen from miles away. The troops struggle to spot their targets. Simona Foltyn: We walked three miles through an area where the commanders expected to find 60-100 ISIS members. But these hills and riverbeds offer plenty of opportunities for the militants to hide and so far we haven’t encountered any and now the bulldozers and humvees are clearing this area so it will be easier to patrol in the future. Simona Foltyn: The jihadists thrive in the dark, attacking check points, kidnapping civilians and security officials, ransoming some and killing others. They also plant improvised explosive devices or i-e-d’s like this one. During the day, the insurgents disappear into tunnels and caves where they keep their supplies, out of sight of drones and patrolling soldiers. But despite knowing all this, and not arresting or killing a single ISIS suspect after two days of searching, the e-r-d commander declares the area cleared. Simona Foltyn: The following day, these two ERD brigades are asked to redeploy to Iraq’s south to quell anti-government protests, leaving these vast areas without permanent security presence – and effectively surrendering the terrain they supposedly cleared back to ISIS. In the weeks following the ERD’s withdrawal, I documented at least two dozen ISIS attacks in the region, based on interviews with civilians and local media reports. Dozens of civilians and security officials were killed or injured in these incidents, which included suicide attacks, kidnappings and ied explosions. 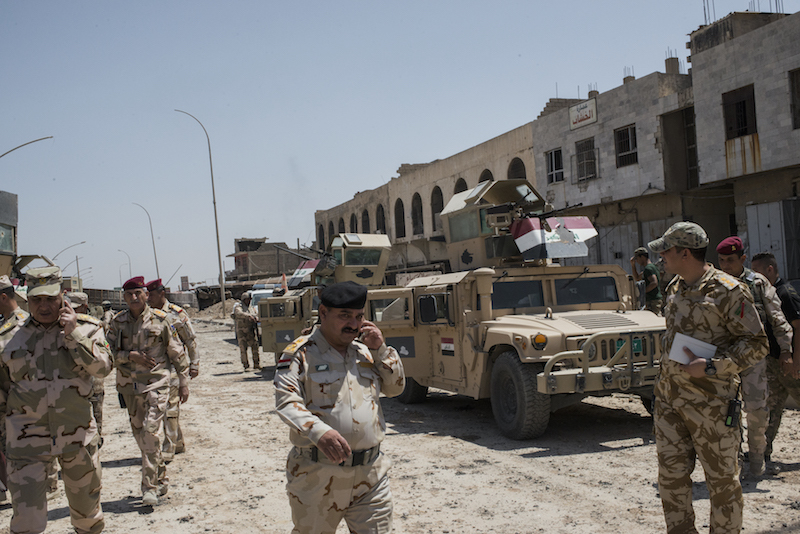 Since the 2003 American-led invasion and the subsequent dissolution of the Iraqi army, the country has suffered from weak governance and a fragmented security apparatus. The ERD is just one of many forces operating in the area. Some are regular government troops. Others are militia organized by religious sect or tribe. Driving between the northern towns of Kirkuk, Hawija and Tuz Khurmatu There’s a dizzying number of checkpoints set up variously by the federal police, Iraq’s elite counterterrorism forces, and a group of mostly Shia militia known as the popular mobilization forces. Despite all this security presence, traveling these roads is not safe. In June, ISIS executed six members of Iraq’s security forces after kidnapping them at a fake checkpoint. Simona Foltyn: We have counted over a dozen checkpoints along this 30-mile stretch of road, some abandoned, some manned by one of three different security forces who don’t necessarily communicate with one another. This lack of coordination has allowed ISIS to set up fake checkpoints, posing as government security officials to then stop vehicles and kidnap civilians or members of security forces. Take a look at Part 2 of this television series. Simona Foltyn: But it’s not just the fragmentation of Iraq’s security apparatus that has played into the hands of ISIS. It is also the country’s ethno-religious strife. Iraq’s Kurdish minority has long desired independence. In 2005, a new constitution granted the Kurds regional autonomy in what is known as Iraqi Kurdistan. The Kurds have their own government and their own defense forces, known as the Peshmerga. But the Kurds have pushed for full independence. Last year, they held a controversial referendum, the results of which overwhelmingly favored Kurdistan’s secession. The Iraqi government didn’t recognize those results. In response to the vote, it launched an offensive in October last year to retake disputed areas that the Kurds controlled. The two sides briefly clashed, and the Kurds subsequently withdrew north – leaving behind a security vacuum. Dler Ghazi: ISIS will always exist in Iraq and in Syria, and that’s because of the political instability in the region. Dler Ghazi works for the Kurdish counterterrorism service. He was in charge of security in Tuz Khurmatu for ten years, until the Iraqi government forced his unit to withdraw last October. I met him in the Kurdish city of Suleiman. Dler Ghazi: The presence of ISIS in our area is because of the security vacuum between us, the government of Iraqi Kurdistan, and the government of Iraq. And in addition there’s a political crISIS between us that has allowed such groups to spring up between our borders. Ghazi agrees to take us to the Kurdish areas that have been most affected by ISIS’ resurgence. Read Foltyn’s investigation about ISIS’ guerrilla war against the Iraqi State. Simona Foltyn: I want to know more about how ISIS operates today, and why it’s so difficult to defeat the insurgents. It’s unsafe to venture beyond these hills, but with Ghazi’s help, I find someone who did albeit involuntarily. Adnan Ali is a Peshmerga fighter. He and two others fell into an ISIS ambush just a couple of miles from here. He was taken to the mountains and held captive for over three months. Adnan Ali: They always threatened to slit our throats. They tortured us all the time. They forced us to get up at four in the morning to pray. After that our hands were bound behind our backs all day. They dressed us in blue jumpsuits so that they wouldn’t confuse us with their fighters. Simona Foltyn: The hostages were freed by Ghazi’s counterterrorism unit in May, after aerial bombardements pushed the militants closer to Kurdish territory. Ghazi filmed this video minutes afterward. Ali is to the right, almost unrecognizable with his long beard. Freed hostages: We thank you so much, you have done so much for us. We brought trouble on you. Dler Ghazi: Not at all, it’s our duty. Simona Foltyn: While Ali was held captive, he says he was frequently moved. He believes this was because his ISIS captors wished to evade detection and aerial bombardment. Adnan Ali: From what we could make out even though we were blindfolded, they were divided into small groups. We could hear them. They were in groups of around 10 people. Sometimes they would move us around and we’d be in a car for three and a half hours, driving through the mountains. Ghazi, the counterterror officer, takes us to the Kurds’ last defense line against ISIS. Dler Ghazi: This is the last outpost, a little bit further it’s ISIS. These guys are volunteers, they are from Tuz Khurmatu and the area. They are volunteering to defend this region from ISIS. It’s very important to protect this area. Because of that river, the trees and the reeds, ISIS has managed to infiltrate this area several times. Ghazi’s intelligence officers obtained these images of ISIS fighters nearby. But even if they see them, Kurdish forces cannot pursue the militants beyond this point. Sherzad Mohammad: That mountain range over there, no force can control it. That’s because of the agreement between us and the Iraqi government. It’s the buffer zone along the 36th parallel. Neither us nor the others can go there without violating the agreement. Simona Foltyn: In a recent tweet, the spokesperson for the US-led coalition claimed that Iraqi and Kurdish forces work side by side to fight ISIS, but Ghazi claims that in Suleimania Province at least, they haven’t carried out a single joint operation. Dler Ghazi: if the Iraqi government does an operation today, they only inform us. They don’t invite us to work together. The Iraqi government has completed two operations in this area, but it’s not efficient at all. They just do some maneuvers and leave. Simona Foltyn: Joint operations would not only allow the Kurds to fight ISIS more effectively. They would also help them regain access to the areas they lost during the 2017 stand-off with the Iraqi government. There’s no doubt that ISIS has exploited the conflict between the Kurds and the Shia-led government in Baghdad, but to fully understand why the terror group has managed to survive, as well as the extent of their power over the civilian areas in their grip, we must travel west to Arab Sunni areas, which we will do in my next report. Simona Foltyn is an independent journalist based in Baghdad. Her work focuses on in-depth coverage of armed conflict, human rights, social justice and development.